I wouldn’t spend much time thinking about your comfort zone at all — not if you want to serve a big mission and live an extraordinary life. A life of ease is not the point; a life of growth and giving is. Here’s how to reach beyond the narrow thinking of comfort zones. #1. Your comfort zone is not important when considering your mission and dreams in life. Your dream, purpose or mission should never be made to bow down to your limited human strengths. Stop worrying about what’s easy for you or comes natural and start focusing on what’s required to serve at the highest levels. #2. Express to the world where you stand. High performers consistently express what they think, feel, need, and dream of. You should too. Don’t just communicate when you feel good. Stretch and share your truth consistently. Never limit your vision for who you can become based on your current capabilities, concerns or stresses. #3. Imagine a conversation with your future self. In this imaginary conversation with your future self, the ‘you’ of the future looks at your whole life in totality today. If that future ‘you’ was going to give you advice on what to stop, what to start, and what your next courageous action should be, what would they say? Follow their advice – now! Want a text message when I release new episodes? Just text “podcast” to 818-492-1802. I’ll also text you two of our most popular episodes, keep you up to date with my books and events, and alert you when I’m in your area speaking or visiting. Like this episode? Then please share it! My blog, videos and podcast are ad-free ONLY because you share my work! ‘Comfort Zones’ are a ridiculous concept to think about. We’re so interested in our own comfort and our own ease. In personal development, we talk about going beyond comfort zones. I think it’s an irrelevant conversation, and here’s why. #1 Your comfort zone is not important when considering your mission and dreams in life. If you have a mission in life, or a dream in life, or a love in life, your comfort zone should never be something you consider. With the strengths-based movement, we’re all supposed to focus on, follow and amplify our strengths. However, that’s just not real. That’s not real life. If you have a big mission or purpose or dream, and it’s beyond your comfort zone, the most important thing to focus on in this entire situation is cultivating the dream. And your dream, purpose or mission should never be made to bow down to your limited human strengths. That’s when I decided to develop my skills with video. Video is not something that came naturally, easily or automatically, and it wasn’t a skill set that I was innately born with. I believe that we were all born with lots of goodness in us, but life throws curveballs. 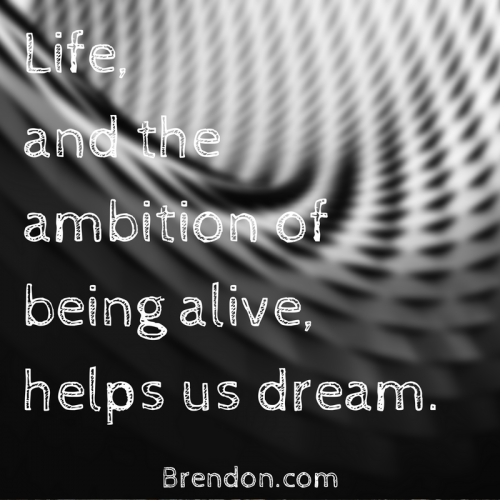 Life, the ambition of being alive, helps us dream. If you’ve been given a dream, don’t discount that because you are not good enough yet. Develop yourself. Weaponize yourself. Teach yourself to be so good at something that your comfort zones don’t even receive consideration. 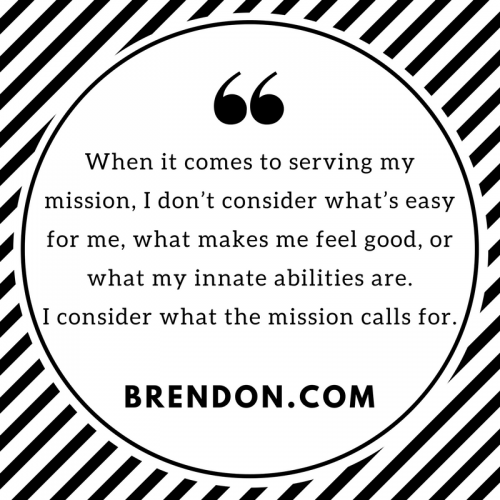 What’s necessary to serve the mission? I don’t consider what’s easy for me, what makes me feel good, or what my innate abilities are. I consider what the mission calls for. Lots of people think that they were born to do one particular thing. And then 20 rolls around, and 30, 40, 50. And they realize that what they thought was important at 10, 15, 20 and 30 isn’t as important sometimes at age 40, 50, 60, 70, 80. Sometimes the thing you thought was your whole life’s purpose and goal in your 30s switches in your 40s and you need to develop new skillsets. If you haven’t found that to be true yet, I bet with a little bit more maturity and higher ambitions and aims, you will find that to be true. Your comfort zone is irrelevant. What are you trying to do with your life? How are you trying to contribute? And how do you grow into that regardless of what you are good at, regardless of what’s comfortable or easy? #2: Express to the world where you stand. If you can’t agree with my first point, then let’s just jump into what to do. Learn to consistently express to the world what you think, what you desire, what you really need, what you really want to achieve and what your dreams are beyond what’s possible for you now. 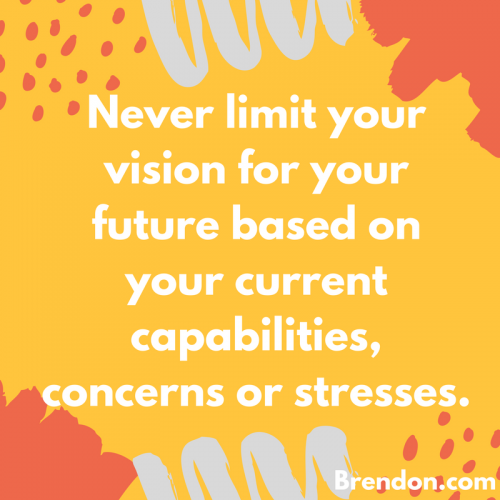 Never limit your vision for your future based on your current capabilities, concerns or stresses. Right now, we live in a world where a lot of people have a dream beyond their comfort zones. They do have something that they want to achieve but they never tell anybody about it because they are fearful that they will look or sound stupid and that people won’t support them. It doesn’t matter if people support you and it doesn’t matter if people cheer you on along the way. Much of my career, people thought I was crazy. They asked me why I was doing what I was doing. They told me that I looked and sounded too young. People were making fun of me most of my early career. It’s okay. I’m not going to limit the expression of who I am, what I think or what I desire of life based on whether or not other people will be comfortable with it or myself. So, I encourage you to ask yourself this question: Have you been honest and fully expressing your thoughts, your feelings, your needs and your dreams with your intimate partner, with your team, with the people that you’re working with? Do people even really know you? Sometimes, what makes us feel comfortable is avoiding difficult conversations. What makes us feel comfortable is making sure everyone accepts us. What makes us feel comfortable is belonging. Those are all great things; however, we have to figure out what’s real and we have to communicate that to others. Personal freedom is achieved by fully expressing who I really am authentically without trying to force it or without trying to comply with everybody else. The desire to chase what matters to me is vital. To follow my dreams and my own path (rather than everybody else’s path) is vital. 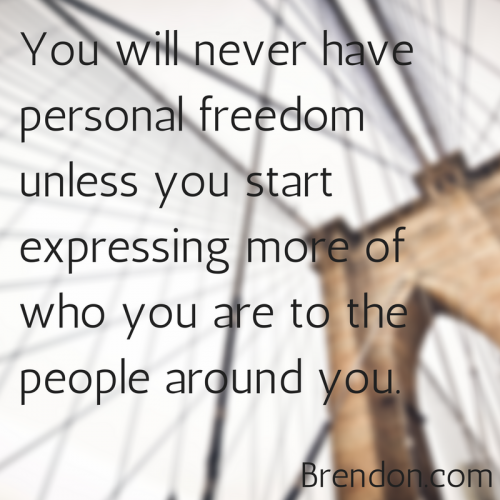 You will never have personal freedom unless you start expressing more of who you are to everybody regardless of whether or not you find it comfortable. #3. Imagine a conversation with your future self. The last piece that always comes to my mind is maybe just a little bit more of imagery for you. In the conversation with your future self, let’s imagine that the you of 20 years from now, shows up at your doorstep and that ‘you’ is stronger, smarter, wiser, wealthier, healthier, happier. That ‘you’ shows up at your door and looks at your life. They look at where you live, what you do for a career, what you’re giving, how you’re showing up, how you are treating other people, and what you are after in life. So, the ‘you’ of the future looks at your whole life in totality today. If that future ‘you’ was going to give you advice on what to stop, what to start, what a more courageous action would be, what’s the first thing they would tell you to be or do to be more courageous? What would that courageous advice be for you?What would your future-self tell you to do? You already know the answer inside. You already know what you could do right now to be more courageous in your life. I say, do it. Forget about the comfort zone. Locate the courageous act. Take three actions towards it today or this week. Just start moving forward, and you know what? You will start living a more courageous life and the more you live a courageous life, the less you worry about your comfort zones and the more you live what we call, The Charged Life.